Unsurpassed reliability meets unrivalled engineering and design excellence with LED tunnel Luminaire Specifically designed to withstand the most heavily vibrating environments, and most extreme industrial conditions, the LED tunnel Luminaire boasts optimum failsafe redundancy and delivers a level of CRI emitted light high enough to emulate natural daylight conditions in a stable and flicker free solution, free of dangerous stroboscopic effects. 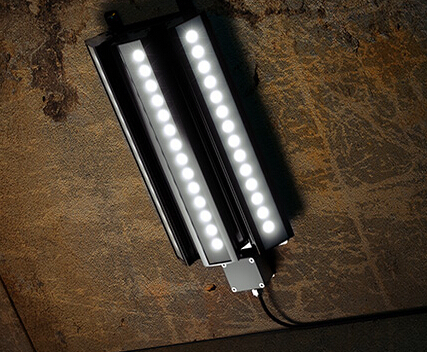 Designed as lighting luminaries for industrial walkways, tunnels and passageways, the LED tunnel Luminaire is the ideal replacement for conventional gas discharge lighting technologies, and leaves conventional lighting solutions far behind. Tunnel LED is engineered to withstand prolonged exposures to vibration and deliver benefits of solid state lighting technology in all conditions. As well as a high lumen output, Tunnel LED fittings produce pure white light that is flicker free and with High Colour Rendering Index. Tunnel LED is one of Coolon’s original luminaires. Over the years it has proven its reliability and performance to the Australian mining industry, time and time again.